There is no threat to BJP government in Arunachal Pradesh while Pema Khandu shall continue to be the chief minister, stated BJP state President Tapir Gao while addressing the gathering of party leaders and karyakatas of West Siang district on the eve of joining of 12 ZPM of the district mostly from 29 Basar Assembly constituency at function held here at Town Hall Club today. Gao said that BJP have been established in all Booth level to shakti kendra, sahari Kendra, district and state level. there is no threat to Pema Khandu led BJP government in state. There is even no sign of any change in leadership of the government at present while the government is stable. Central government led by Prime Minister Narendra Modi have launched more than 100 central sponsored schemes (CSS) which need to reach last people of the village and town who are in dire need of it and the benefit should also reached to them. The policy of the party to present report on activities of the party and development of state being sent to centre regularly and therefore it is the need of hour to work untimely and coordinate all officials and PRI members and the elected representative of the area sincerely with education Gao said. BJP never want or interfere on someone what to eat or not, the slaughter house close down in Utter Pradesh are due to court order, our party have never discriminated on line of religion and sighted several leaders of different religion in the party in different states of the country. Gao said that there was a move to dislodge Pema Khandu would never materialised as there is no provision to do so in middle of the time. Even the NEDA partner PPA who also tried to dislodge the stable government and BJP being the part of NEDA disassociate them and now the government is stable and would work smoothly and there is no issue of change of leadership in state government Gao added. He further appeal the party leaders and workers to maintain cleanness and swachh bharat abhyan in own resident, offices, market and town so that all live free from dirt and stay fit and fine with sound mind. He emphasis on creating of awareness of campaign against drug which are damaging the health of young children. Basar local MLA and Parliamentary Secretary Land Management, SJETA &WCD Gojen Gadi in his address said that our state depend on fund from central government so we need to clear our works from time to time so as to received fund on regular basis. Since the government in centre and state is of BJP so most of the leaders and PRI members have joined the saffron brigade to join hand to the government led by Pema Khandu to rapid development of state. Schemes and project of his assembly constituency will be equally distributed as mostly of the PRI members have joined BJP and no discrimination will be made from his end and sought such attitude from them in implementation part and cooperation. Welcoming 1 INC and 11 PPA ZPM to the party and requested them to work hard and sincerely. Gadi also echo the Gao statement that there is no threat of Pema Khandu government and we all are united. He said that he have been trying his level best in getting various schemes under his department and till date schemes amounting to more than Rs. 170 crore are under pipeline for the state development. Gadi also emphasis the need of maintaining healthy environment for good health. Dumporijo MLA Pakanga Bage said that ego damage the unity and integrity and strength . He appeal all to extend helping hand to local MLA Gojen Gadi for party strength and development of area. BJP state General Secretary Jarpum Gamlin while emphasis on maintaining good relationship among the workers and leaders of the party for strengthen of the party at the grassroots level. He warned the workers those who do maintain new and old among the fellow leaders which determinate to party’s strength and action will be taken. He appeal all workers and leaders not to post all official and proceeding of the party meeting in social media without taking permission. West Siang BJP I/C Lilong Lingfa, District President Yomto Jini, State media cell Member Dotum Sora, 29-Basar Mandal President Mari Nyori & General Secretary Nyoto Nyodu among other address the gathering. Aalo (W) ZPM Yonggi Ori Basar ZPM Tonyir Basar while expressed their willingness to join the saffron brigade on the initation of the Basar MLA Gojen Gadi on behalf of other colleague. 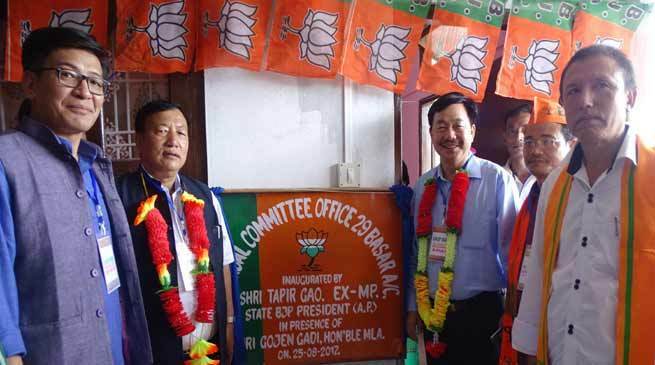 Earlier in morning the team led by Tapir Goa and lawmaker Gojen Gadi, Paknga Bage and host of BJP leaders inaugurated the BJP mandal office at Basat Market line.